It's been a career filled with so many landmarks, that Rahul Dravid nearly forgot about the significance of June 20, 2006. Not until someone in the press reminded him, did he realise that he'd just completed ten years as a Test cricketer. It's been an unforgettable journey since that glorious day at Lord's in 1996, the likes of which Indian cricket might not see in a long time. Dravid looked back at the phase with satisfaction, talking about how fortunate he was to have got this far. "I've been able to do what I love for ten years at such a high level, at a level that's given me great satisfaction" he told Cricinfo while tending to Samit, his baby boy. "I've played with and against some of the great players in the world, for ten years. What more can you ask for? To be able to make my hobby into a career for ten years is fantastic." The moment it all started was fresh in Dravid's memory. "It was very special to make my Test debut at Lord's, walking out there and representing your country for the first time. Playing Test cricket was something I wanted to do all my life and it's been great to fulfill so many of my dreams." It's been a rise like few others, from a young boy whose first instinct was to leave the ball to a most complete batsman who can hit, and hit well. Even more, it's been a transformation of the person: "I've changed as a person and as a cricketer. Just the experiences I have gained over ten years - played in different conditions, travelled the world, met different people. I have experienced so many things in these ten years; I have experienced success, I have experienced failure - all that has obviously had an impact on me as a person and as a cricketer. I hope it has been in a positive way but more importantly for me, it has been an enjoyable ten years." Dravid's achievements hardly need chronicling, but one of his most significant might be that of scoring runs in all conditions, all countries, against all attacks. Greg Chappell, India's coach, highlighted that point. "It is an indication of his ability, of his physical strength, his skills, his mental strength. From a mental point of view, he's one of the toughest cricketers I've met." It's a point of view that many of Dravid's team-mates endorse. "I have seen many cricketers but no-one with as much concentration," said Harbhajan Singh. "Apart from that, it's amazing how he's lifted his game in the last four years. He went from a good player to a great player. You learn a lot by watching him, realise why he is doing this or that. He's a very good thinker of the game, talks very well on the game. Thinks ahead always - if we do this now, that may happen in the evening session. It's a lot of fun discussing cricket with Dravid." 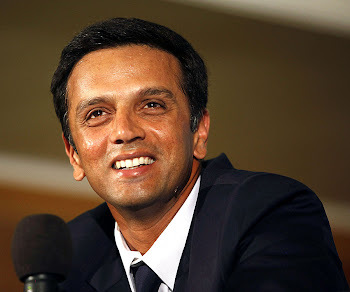 It would need several reams to fill Dravid's achievements but the last five years will occupy a special place for him. "The last five or six years have been the period when I have been the most involved and the most enjoyable part of it. The way the team rebuilt after the Test in Karachi [going on to win the one-day series earlier this year] is probably my best moment as a captain." Dravid will undoubtedly go on to break several more barriers but nobody can forget the moment that set the whole process off. His 95 on debut confirmed that he belonged in this arena but his decision to walk when he feathered an edge off Chris Lewis to Jack Russell behind the stumps proved that he was there to stay. He'd side-stepped the first hurdle but no bowler, wicketkeeper or umpire was going to stop him from clearing several more.